What does it take for kids to live an extraordinary life? On this very special show, our own Neva Lee Recla of the Super Power Kids podcast joins Laura Greco of SuperPower Mommas as they discuss this child’s unique journey and mission. And, extraordinary Neva is! An entrepreneur, author, speaker, and inspiration, Neva is on a mission to inspire 1 million kids to do business and to encourage adults to support them. And she is only 9 years old. You will not want to miss this special show as Neva gives perspective through the eyes of a child for all of us mommas to see what her experience is as an entrepreneur. At the age of two, she asked her parents for her first business cards and she hasn’t looked back since. From her veteran, can never say that word, philanthropy, she spreads light, love, and pixie dust. To hosting her Super Power Kids podcast, she delights and impacts the world one connection at a time. So, welcome, Neva. We’re so excited to have you. Are you there, honey? We’re having a little trouble with our show. Breaking up. Can you hear me, honey? Yes. Thank you. So excited to be on. Yeah. Hope you heard some of what I said. Seems like we’re breaking up today. Anyway, the last part that I didn’t share was how old you are. How old are you, honey? You are nine. So, you turned nine. How exciting. And such a big life you’re living. Our show is called Rising Up to Live an Extraordinary Life, and Neva is certainly setting that example. As always on our SuperPower shows, we always ask what’s your superpower. Would you like to share that with us today, Neva? Your superpower? I’m really good at connecting in a space, a certain frequency with people. Yes. I’m really good at connecting in a space, a certain frequency with people. So, I can do that and connect with them in a way that they need to, and I need to. One of my other ones is I kind of feel like a sponge some times. I can kind of absorb people’s energy. And sometimes I enjoy being able to do that, because I’m learning how to put a bubble around myself so I don’t have to. But sometimes it’s a giant wave of energy and I feel like I’m getting sucked in. Those are some of my superpowers. Very cool. Very cool. Tell me, how do you use your superpowers to expand in the world and be that extraordinary life? Well, I use them for… I can use them in business, in my learning. I enjoy using my superpowers for good, like we say at Super Power Experts. I enjoy being able to teach people. That’s how I live my extraordinary life, is teaching people how to use their superpowers for good as well. Very good. Very nice. That’s very nice. And you started when you were really quite young. So, what was the spark, do you think? Do you know? Well, when I was younger, I saw my parents had business cards and they were handing them out to people, and that really excited me. So I said, “Mom, Dad, I want my own business cards.” Their original answer was no, but then they said yes. Then we realized that we needed a business to go with those business cards. So, I started doing… A person brought us Italian glass bracelets and said I could sell them and keep the profits, and I sold them for $10. It’s the business conference we go to. That’s where I learned to do business. But I did that. And then I enjoyed it, so I kept on going from there. From going, you sold your glass bracelets, right, and then eventually I know when I met your mom on the phone, you… That was about the time you were starting your show. Which was around seven, right? Yep, that was two years ago. Yeah. So, was that exciting? Was it scary? What was it? I’ve had some really amazing conversations with people and people have brought on their kids sometimes, and that’s always fun. Both. ‘Cause I said I wanted to start SuperPower Kids and my mom and I had a conversation that she doesn’t want to coach kids. And I said, “Mom, you wouldn’t be the one coaching them, I would.” So, we started that and now I’ve been doing my podcast for two years. I was originally nervous. It took some getting used to. But I enjoy it. I’ve had some really amazing conversations with people and people have brought on their kids sometimes, and that’s always fun. Yeah. I’ve been doing that and I enjoy it a lot. That’s really cool. You know, it’s very exciting to have you, Neva, on the show today. You know that it’s SuperPower Mommas, right? So, speaking mostly to moms. I like to encourage moms to really be who they be, you know, in the world. And to recognize their own superpowers and how impactful they are. So, we’re gonna be taking a quick break in a minute and I wanted to say that we’re gonna continue this conversation and we’re gonna talk about how your mom was able to assist you and what pieces of that really helped you, and then some other things that you’ve been doing with your life. Because you have some other little interesting components. 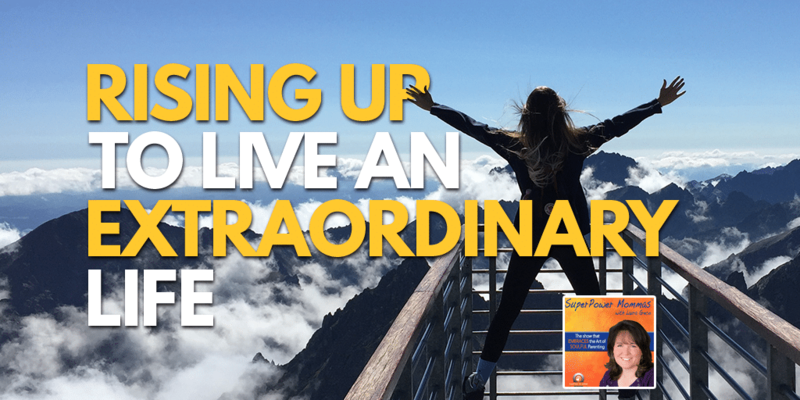 You’ve been living such an extraordinary life, right? Already. Your little life. So Neva, where can people find you? You can go to NevaLeeRecla.com. That will bring you to all of the stuff I do. Okay. Great. And you have your podcast, too, right? Yeah. It will take you to there. Great. Perfect. Okay. Everyone, wait for us. We’ll be right back. We have to go for our break. You’ve been listening to SuperPower Mommas on the topic of Rising Up to Live an Extraordinary Life with Eva, Neva … Neva Lee Recla. So, we’ll be right back.